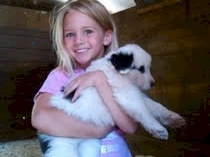 Devil's Gulch Ranch | We also sell livestock guardian dogs! Livestock Guardian Dogs are an amazing group of working livestock dogs that come from several breeds. 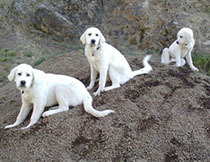 We currently use two breeds, the Maremma and the Akbash. The Maremma is an Italian breed with a medium flat coat. They are white and bond strongly with their charges. While they can be friendly, they prefer to be with their herd. The Akbash is a Turkish breed with a short flat coat. They tend to be very large and very strong. They will pursue a predator and are always on border patrol. We chose these two breeds as a foundation for our stock in our efforts to create a great working Livestock Guardian Dog that works well with livestock in our modern farming realities and is a good companion dog as well. 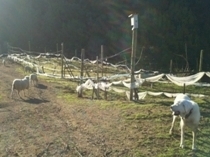 We started breeding our own dogs because so many ranchers were having trouble finding good working, healthy dogs. Some of the biggest problems with the Great Pyrenees being used ten years ago were horrible matting of the fur, resulting in foxtail injuries; aggressive behavior toward livestock and humans; wandering outside the ranch boundaries and a short working lifespan. In our efforts to produce better dogs, we chose the shorter hair breeds that wander less and bond more strongly with their herd. While there is no way to guarantee that a dog is free of potential genetic problems, by evaluating the offspring and testing, we can make sound decisions affecting the future of Livestock Guardian Dogs. We are X-raying our breeders and certifying them for hip dysplasia. There are several causes of dysplasia other than genetic, but with a good diet and good genetic selection, we are able to keep our dogs active for many years. Despite our best efforts, some dogs do not work out as guardians. We find them suitable for homes that meet their needs, like Athena who now guards two young boys and their family. We do offer puppies for sale. These dogs are not for everyone. They need lots of room and typically take at least two years to train. They have been bred to think for themselves and make quick lifesaving decisions, which are not always ideal for households. Please remember that if at any time in the future you can no longer keep your puppy, please contact us and we will help you find a new home for them or take them back. We do not offer refunds. Please do not abandon your dog at a shelter. We will take them back. Well-bred dogs you can own!